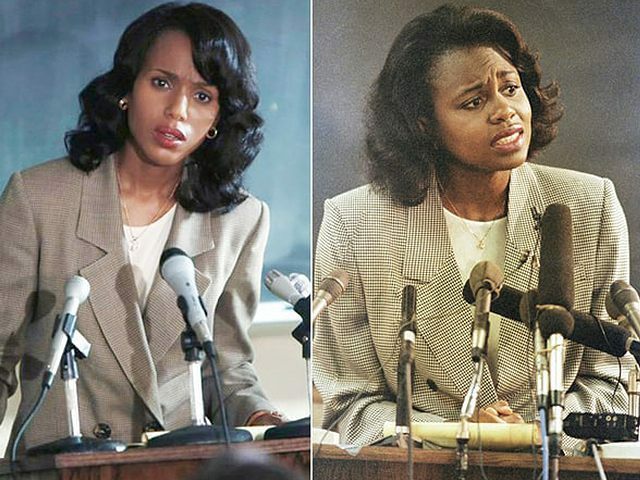 Confirmation, set to premiere on the pay cable network in April, explores the 1991 confirmation hearings of Supreme Court Justice Clarence Thomas, in which Hill accused Thomas of sexual harassment while he was her boss at the Equal Employment Opportunity Commission. The allegation set off a media firestorm and forever changed Americans’ understanding and discussion of workplace harassment. In addition to starring as Hill, Washington will also executive produce the film, which boasts a star-studded cast including Jennifer Hudson, Greg Kinnear, Jeffrey Wright and Eric Stonestreet. Wendell Pierce co-stars as Clarence Thomas. The Scandal star said she was “terrified” to play Hill because of the increased responsibility of playing a real-life person who is still alive. But she said that ultimately, the film is important because it comes as issues of sexual assault and race continue to dominate today’s news headlines. Abortion rights groups had success in blocking the confirmation of conservative Robert Bork in 1987 by portraying him as a right wing opponent of abortion. But Michelman said Thomas’ positions on abortion were “far more extreme” than Bork’s. Michelman and other supporters of abortion rights feared Thomas’s blackness was a distraction from the danger he posed as a fifth and deciding vote on the Supreme Court against legal abortion. Washington is an interesting choice to play Hill, given her public support of abortion. The actress memorably starred in a controversial episode of Scandal in which her character undergoes an abortion set to the hymn “Silent Night.” She later tweeted her full-throated support for abortion provider Planned Parenthood. Confirmation was written by Susannah Grant (Erin Brockovich) and directed by Rick Famuyiwa (Dope). The film premiers in April on HBO.